The promotional video showing a leaf blower exposing a girl’s bottom was taken down last night by the Concertgebouw orchestra, which was using it to promote its new season. No explanation was given for the takedown, and certainly no apology. If you’re going to criticize something, you might as well get your facts straight first. The organization responsible for the advertisement was the Concertgebouw’s independent youth organization ‘Entrée’. The orchestra as such had nothing to do with this ad and has no responsibility to say sorry for anything. Moreover, if you ask Bernard Haitink, he will confirm that the orchestra offered a full apology for all the recent mishaps, which is why the relationship between orchestra and conductor has since been normalized. I know, I know, nuanced and unbiased reporting make for far less interesting headlines, but they come at the expense of professional and journalistic standards. Haitink had to wait 30 years for that apology…. longer than a life sentence. Actually a life sentence in the Netherlands (as in for instance the USA) accounts to a full life sentence (not saying thats a good thing but still..). As in basically everything you posted either serious or in irony. Get your facts straight. You cannot expect me to be an expert in Dutch penal law. If you’re going to criticise the British, and claim to be bilingual, then at least learn to spell the word ‘British’! Thanks LMZ for telling us the facts and expose the cheap anntention grabbing self-righteous “journalism” displayed by NL. Why should there be an apology? Yet another example of people giving in to PC nonsense. Shame. What a sad, rebarbative and embarrassingly immature comment from ‘Dreyfus’. There is a difference between the Concertgebouw and the Concertgebouw Orchestra. The video was from the Concertgebouw. So don”t blame the Concertgebouw Orchestra. I think the video was produced by the hall, not the orchestra. It was very clearly captioned Het Concertgebouw, as opposed to Koninklijk Concertgebouworkest. On behalf of Entrée, the youth association of the Royal Concertgebouw Orchestra and Het Concertgebouw and producer of the video (and as such not Het Concertgebouw contrary to what the article states), I would like to respond to your article. We very much regret the fuss around our campaign. 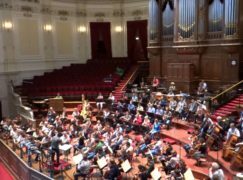 The campaign’s intention was to enthusiasm youngsters (ages 18 to 35 year old) in the Netherlands and especially Amsterdam for classical music by literally portraying titles of well-known pieces of music ‘with a wink’. In view of the negative comments that the campaign unintentionally raised we decided to take the video offline. I would like to emphasise that Entrée is an organisation that works closely together with both the Royal Concertgebouw Orchestra and Het Concertgebouw, but we are autonomous. Therefore, we develop, create and launch our own campaigns, as we did for the series around ‘having a wrong idea around classical music’. Also, we build our own relationships with our members, currently over 7500. All our outings are focused on reaching young audiences and encouraging them to listen to classical music. With that perspective we created this video, one out of a series of four. For reference, out of this series, the other ones consisting of things like a gardencenter-variety bright pink fake flamingo being burned by a lighter in a ‘reference’ to Stravinsky’s L’Oiseau de feu, this one obviously was the most controversial. Finally, I would like to request you to make one editorial adjustment to the article. The article mentions the campaign was published by Het Concertgebouw. This is not the case. Entrée is the owner and promotor of the campaign. I hope you respect our request to modify your article. Your strategy, Ms. de Boer, was to “borrow” the “interest” people have in bodies and use it to sell. This is a classic marketing error, called “borrowed interest” in fact. It does not work because what you borrowed has nothing to do with what you are selling. For the targetted audience of 18-35 years, the video was childish and patronizing. But populists would have loved it, of course, and without any intention to attend the concerts, with or without their children. Technically, Entrée maybe autonomous but it doesn’t really matter because the group is clearly affiliated to both the Concertgebouw and the Orchestra. This campaign and others are set up specifically to get people aged 18-35 to these two institutions, not to other ones. Do you honestly think you “encourage them to listen to classical music” by publishing tasteless rubbish videos that reveal naked buttocks and burnt plastic flamingos? Where does this frantic, absurd, constant need to use popular culture in order to “sell” classical music come from? As we can read on your website, “Fun comes first”. But can’t you think of a bit more classy, subtle, refined, stylish ways to attract a new young audience? It is lying to the masses to get bums on the seats – pure financial considerations, unrelated to content. There is nothing of an attempt at education in such trends. I’m afraid Noltze is right. The key word here is *education*. Me, too. Don’t expect it, though. I had my doubts about the reliability of this site for a while now but seeing you not even be aware of the crucial difference between the Concertgebouw and the Concertgebouw Orchestra kind of retroactively underminds all creditbility of any ‘news’ posted here to me. I mean, I fully understand that for a Brit, Londener even? it might be utterly confusing to have both an orchestra AND a concerthall (let alone both of world class), but still, as we speak I’m scrolling through earlier posts of yours to see whether you’ve regularly written ‘Beethoven’ when you ‘meant’ ‘Bach’. Classical music can be confusing. I know, no need to feel ashamed. Opening up classical music to the uninitiated seemed to have been the intention of this youthcampaign in the first place. Please appologize me, on top of the staggering uninformdness I’m just slightly taken aback by your tone towards youth-activating projects in your article. Your site needs the online kids to connect with classical music. Possibly finding their way to sites like yours. All of this is not necessarily my problem as there are many other classical news sites to go but I liked your layout and mobile-friendly form and not unlike, presumably, you I can’t simply rely on lasting support for our shared love from only the ever shrinking graying masses. I am generally aware of the distinction between a building an an orchestra. It’s the subtleties of your Dutch humour that elude me. There was no humor in this or the other advertisements, unless you happen to be a 10 year old who just discovered anatomy. Regardless of official associations, the orchestra should have immediately weighed in. Such sophomoric humor is for the unsophisticated in any language or culture. I does classical music no favors. I take it you read Dutch? Amazing to meet antoher of my co-lingaulists here! Hallo! Hoe gaat het met je moeder? Opvallend dat je de spot en de plek ervan in de campagne als geheel niet begrijpt? Mi madre y yo lo entendemos muy bien. El absurdo juvenil es el mismo en cualquier idioma. Yeah sorry didnt really catch that one, don’t speak Latin-American 3rd worldcountryspeak. Good to see you guys have internet now though! Bom dia para você too! But maybe this is just me not understanding the subtleties of fine Brittish native culture. Don’t think that did any form of music any good. Had that other link someone posted still on app. If you you consider Spain to not be part of the EU, then sure. Just remember that Spanish (there is no “Latin American” nor is most of central or South America considered third world) is the most spoken language in the world after English. That said, variations of the word “prurient” exist in every language. Actually, no. Did you know ‘dada’ and ‘moma’ are universally the first spoken words..sounds..by any baby in all cultures. (We project te meaning of ‘dad’ and ‘mom’ on it) so…that would maken ‘baby’ the second or third most spoken language in the world if you’re counting Spannish (in all its dialects). But we’re talking actual, productively usefull languages here so that would place Spannish, given the economically borderline defunct countries where its spoken..including Spain..somehwere way down the list beyond Manderin or even Cantonees (or Portuguese). But lets not let the Brittish break up our union in arguing. Alle Menschen werden Bruder. Remember? There are even more people speaking Hindustani than Spanish. @ AMETFAN: Or unless you happen to be an orchestral musician, who by chance, frequently find themselves amused by humour of this level. Try asking an orchestra to start rehearsing a passage from figure 69 and you’ll see what I mean, I’ve only once known there to be no reaction. People are amused by childish, slapstick humour. Many comedians and actors have built entire careers out of it; there’s nothing to be ashamed of or prurient about. Norman isn’t representative of most of Britain – and he certainly never bothers to come to Scotland, so doesn’t speak for us. I suspect that most commenters here are neither marketing experts nor in the 18-35 target bracket. I wonder whether a Dutch-speaker (such as John Borstlap) would be able to explain how well the joke works in Dutch, or whether it assumes that the audience understands English. I know that most Dutch people are fully bilingual in Dutch and English (and, I am told, even speak English in preference to Dutch), but I suspect that even many native English-speakers are unfamiliar with these terms in their musical senses. John Borstlap is an allmost 70 year old, Amsterdam-hating (once, years ago, called Het Concertgebouw “a brothel”) extremely conservative (not in a good way) marginally failed former composer. He is the personification of everything this series of videos is not aiming at. I mean, its not about the age, I’m pretty sure Norbert would understand the series and even the place and meaning of the ‘skirt’ one if he was born and raised in The Netherlands but mr.Borstlap is simply a querrelant. (As a sidenote: I myself am slightly above the 18-35 age bracket). Humor indeed isn’t entirely internationally translatable but aversion against too blunt or banal of even misplaced juvenile humor is. The best I can do to convene the place of these spots in society and its target audience is to suggest considering the group of young adults working there to be sort of the equivalent of very polite well raised brilliant intellectual and entrepreneurial (former) OxBridge classics students, all of them in one way or another playing instruments themselves. Well. Probably at least. During the years the U.K. was part of the European Union I got to consume a lot of Brittish comedy on BBC 1 and 2 (and bbc radio..next to of course the classical music there) we got on our cable over here in The Netherlands so I sort of got a feel for understanding all the kinds of Brittish humor. Its a true treasure of your culture. But even the Germans have their own pretty strong kind of comedic-style. Its slightly less accesable because of its deeply layered structure and deadeyed irony and sarcasm. The Dutch work more in sort of a meta-layer. And in that Dutch style this was something aimed at the smartest most forward thinking potentially culturally interested. Still not entirely sure if it was a good campaign but I read the spots were a result of a competition amongst young filmmakers. So there’s that.. Should they have realized the spot would get exposure outside the Netherlands? Maybe. Should foreign viewers and interprators of the spots go through the mind-wrestling of gaining a cultural-relativist ‘gaze’. Could be. For us Dutch it feels a bit like those moments you realize we were the first and still are one of the only countries where gay-marriage is totally normal and legal. So download the spot and sexually objectifyingly enjoy the (mediocre) derriere if that for you guys is the only discernable meaning of it. Otherwise admire how much difference our beautifull planet and species encompases behind the initial facade of seemingly global unversial Anglo-American culture and how much we still can learn about each other. Sadly though because of the Brexit the brittish choose not to continue broadcasting on the mainland, so we’ll going to have to donthat learning without the BBC. It will be missed though. Are you using a translation tool? Haha no I don’t. No translation appnand even no spellcheck. In fact, having to ignore all the Dutch spelling suggestions my phone is giving as I type. This just basic (be it upper-tier) highschool level English in The Netherlands. If yes, could you please tell me which tool it was? I also want to improve my English. BTW, what is the best spell and grammar checking tools out there? Preferably free and open-source. Thank you. This explains a lot. You’re excused, but not forgiven. Q: What separates humans from animals? A: Humans know to use tools. The problem of Holland is it deeply-felt and strongly-cultivated provincialism, of which this comment is a nice, smelling example. There are villagers, deep in the fields, who consider themselves at the centre of the world because they don’t know any world, and if they would travel in it, or would inform themselves, they would not be able to fit what they see into their mental framework. It is a type of consciousness entirely made-up of fantasies, and very conventional ones, moulded in the sixties in a climate where anything that is beyond its level is immediately called ‘conservative’, like the Pavlov dog expecting his bone. “… And in that Dutch style this was something aimed at the smartest most forward thinking potentially culturally interested.” In Holland? Possibly, but if they were ‘smart’ and the ‘most forward thinking potentially culturally interested’ – whatever that may mean – they would have been embarrassed by that silly video and feel patronized at best. By chance, I know something of the Oxbridge intellectual level by direct experience. And it is far, very far removed from this sorry little burb with its spelling errors and juvenile mud slinging…. the mentioned video is obviously meant for such people. OK folks, after reading the entire thread here I think it’s time to flush the toilet. Enough now. Let’s all grow up. A little less self-importance (and dutch “eigenwijsheid”) will do us good. I had never been in Holland (my mother always warned us), but a week ago I had to go to Amsterdam to visit an unwilling agent. I had planned to stay a couple of days longer to visit the famous coffee shops, for the famous ‘coffee’ you know, but when I saw a couple of leaf blowers in the streets, seemingly cleaning the first autumn leaves but looking around to the women, I took the first flight back. Even if you are grown up, you still have to take sh$t, everyday. Well, maybe the more grown up, the more difficult. But it doesn’t mean that you don’t sehnsüchtig want to. The proper suggestion would be “OK folks, it’s enough. Let’s take some new ones”. So much ado about nothing by the PC brigade the first to applaud the tasteless Femen exhibition! Enough of this and lets concentrate about music not about the mores of the new puritans!